Sedentary behaviour (SB) has been proposed as an ‘independent’ risk factor for chronic disease risk, attracting much research and media attention. Many countries have included generic, non-quantitative reductions in SB in their public health guidelines and calls for quantitative SB targets are increasing. The aim of this narrative review is to critically evaluate key evidence areas relating to the development of guidance on sitting for adults. We carried out a non-systematic narrative evidence synthesis across seven key areas: (1) definition of SB, (2) independence of sitting from physical activity, (3) use of television viewing as a proxy of sitting, (4) interpretation of SB evidence, (5) evidence on ‘sedentary breaks’, (6) evidence on objectively measured sedentary SB and mortality and (7) dose response of sitting and mortality/cardiovascular disease. Despite research progress, we still know little about the independent detrimental health effects of sitting, and the possibility that sitting is mostly the inverse of physical activity remains. Unresolved issues include an unclear definition, inconsistencies between mechanistic and epidemiological studies, over-reliance on surrogate outcomes, a very weak epidemiological evidence base to support the inclusion of ‘sedentary breaks’ in guidelines, reliance on self-reported sitting measures, and misinterpretation of data whereby methodologically inconsistent associations are claimed to be strong evidence. In conclusion, public health guidance requires a consistent evidence base but this is lacking for SB. The development of quantitative SB guidance, using an underdeveloped evidence base, is premature; any further recommendations for sedentary behaviour require development of the evidence base and refinement of the research paradigms used in the field. There were calls to introduce public health guidelines on sitting as early as 2008.14 The response to the accumulated research in this area has been the inclusion of SB-related messages in several national PA guidelines aimed at adults and children, including UK,12 Australia,15 New Zealand,16 Canada,17 Germany,18 Norway19 (see table 1) and in statements of eminent scientific authorities.20 A set of quantitative workplace-specific SB guidelines21 recommended reducing work time sitting by up to 4 hours per day. This guideline, however, was not evidence based and it has been criticised for possible sit–stand desk and related industry interference and undeclared conflicts of interest.22 Calls for developing population-wide quantitative sitting guidance continue apace and are often based on cross-sectional findings. 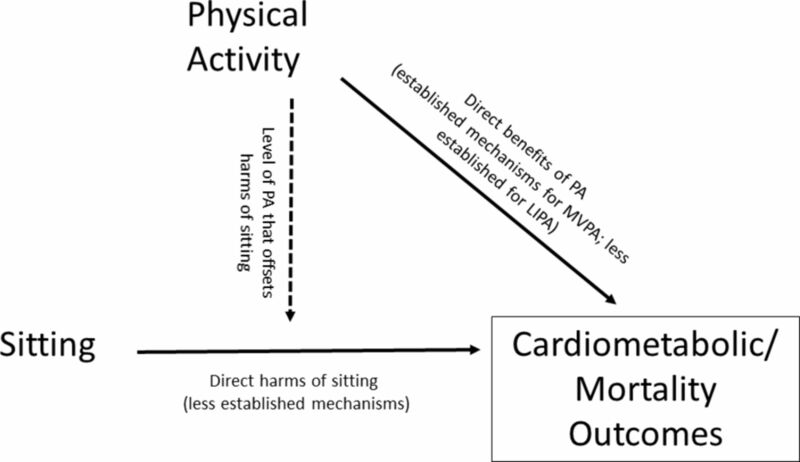 The aim of this review is to evaluate key aspects of the SB evidence relating to cardiometabolic health and mortality and to discuss the timeliness of developing specific guidelines on sitting. Definition of SB: is it not all about sitting? The ubiquitous behaviour that is considered a health threat is sitting. There are two modern definitions of SB. The first of these definitions is purely physiological and is synonymous with the lower end of the energy expenditure continuum <1.5 metabolic equivalents (METs)23 which, strictly speaking, also includes standing quietly (1.2 MET).24 The second definition has physiological (<1.5 METs) as well as postural (in a sitting or reclining posture) and contextual (waking times) components.25 26 As previously noted,27 the tabled MET values for some common types of sitting range from 1 to 2 MET28 and therefore do not strictly conform with either of these definitions. For example, sitting while fidgeting and sitting in the classroom are both assigned 1.8 MET; driving a car is assigned 2.5 MET. Yet, the health impact of both time spent driving29 and classroom time30 is examined as SB. This lack of consistency on the definition of SB is of concern as it makes the relevant evidence prone to misinterpretations, as shown in figure 1 and discussed in the subsequent sections. Recent efforts to further refine the definition of SB26 by introducing terms such as ‘stationary behaviour’ (lack of ambulatory movement in any posture), for example, may help resolve some of the issues described in the following sections. Extrapolation of non-sitting-specific ‘sedentary behaviour’ research findings into messages on the health risks of sitting. Is sitting an ‘independent’ risk factor? From the epidemiological evidence, it is becoming clear that the associations of sitting time with all-cause mortality (ACM) or cardiovascular disease (CVD) mortality are often seen to be dependent on MVPA levels.33–36 A recent large study involved a pooled individual participant meta-analysis of self-reported sitting studies published as part of the 2016 Lancet Series on Physical Activity (n=1 005 791 for ACM; n=849 108 for CVD mortality analyses).37 Self-reported sitting time was categorised as <4, 4, <6, 6–8, >8 hours/day and the quartiles of PA had medians corresponding to roughly ≤5, 25–35, 50–65 and ≥60–75 minutes/day of moderate intensity activity. Compared with those in the lowest sitting and highest PA group, a dose–response association between sitting time and CVD death was noted in least physically active group with HR increasing from 1.34 (95% CI 1.24 to 1.43) in the bottom to 1.74 (95% CI 1.60 to 1.90) in the top sitting groups. Associations with CVD mortality in the second and third PA quartiles were less dose dependent, less stable and of lower magnitude. There was no evidence for an association between sitting time and CVD mortality risk in the top PA quartile and results for cancer and ACM pointed in the same direction.37 These data do not support the almost concurrently published 2016 Science Advisory from the American Heart Association20 that concluded ‘it is likely that SB influences risk in part through some distinct mechanisms that act independent of MVPA’. More examples of the perpetuation of the idea of ‘independence from MVPA’ include a recent dose–response meta-analysis that also concluded that sitting was associated with greater risk for several major long-term outcomes ‘independent of PA’.32 Such a conclusion indicates the need for a tighter definition of ‘independent associations’. Studies included in this review32 assessed independence by merely treating MVPA as a potential confounder. Although this approach cannot be discarded,27 32 it is insufficient for understanding independent health effects of sitting on its own as it ignores the evidence of effect modification.33–37 Figure 2 shows a conceptual diagram of how the associations of SB with long-term health outcomes may be dependent on PA.
Conceptualisation of the associations between sitting and cardiometabolic/mortality outcomes with physical activity as an effect modifier. LIPA, light intensity physical activity; MVPA, moderate to vigorous physical activity; PA, physical activity. Other grounds to challenge the idea of ‘independent associations’ is the absence of a convincing biological mechanism through which too much sitting harms health irrespective of PA levels. The first and perhaps still most popular proposed mechanism was an animal model,7 which suggested that prolonged sitting impairs lipoprotein lipase activity and this could be prevented by changing posture to standing, with no further benefit from exercise. But this framework was originally published 15 years ago38 and despite not having been confirmed in humans in it is still cited as a plausible mechanism.32 More recently, prolonged sitting has been implicated in endothelial cell dysfunction caused by reduction in leg blood flow-induced shear stress.39 This is a coherent mechanistic framework but it does not support independent effects of sitting as it acknowledges that endothelial dysfunction is prevented if sitting is preceded by an exercise bout.39 Several other attempts40 41 to identify and develop models for independent mechanisms of the effects of SB on cardiovascular outcomes are also not well developed; thus, the likelihood that SB is mostly the inverse of too little PA is still plausible. From the public health point of view, the independent association of SB with long-term outcomes, if any, can be used to calculate the theoretical amounts of sitting reductions required to achieve population-wide risk reduction equivalent to meeting the basic MVPA guideline (20%–33% reduction in ACM and CVD mortality risk42 and 13% reduction in type 2 diabetes mellitus (T2DM) risk43). Even if independence from PA is assumed, the reported per-hour 4% increase in ACM and CVD mortality risk among high sitters32 and the linear 1% increase in T2DM risk32 suggest that the sitting reductions required to achieve MVPA guideline equivalent risk reduction is in the order of 5–13 hours/day. Considering that the average daily reductions achieved by recreational and workplace SB interventions is substantially lower (0.5 hours44 and 1.2 hours45), both the clinical and public health impact of the above meta-analytical estimates32 are likely extraneous. 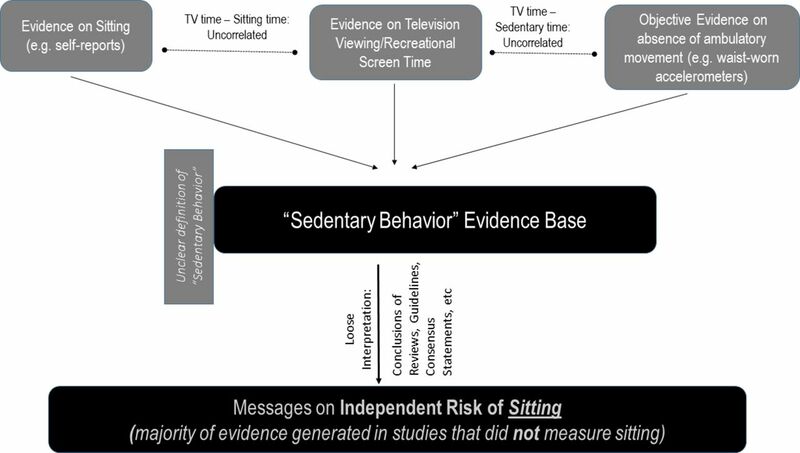 Evidence on TV time as a marker of SB: health risks of sitting or a cluster of confounding? Much of the early4 5 46 and current47 SB research was concerned with the study of television viewing (TV).48 49 At face value, such a focus is justified because screen media is a major discretionary component of total SB, with national studies showing that as of 2012 adults in, for example, England spent 2.8–3.1 hours/day watching TV.50 However, the literature on TV viewing and health tell us little about sitting. First, studies in adults have established that TV time is poorly correlated to sitting time. The largest (n=5738) such study to date examined the correlation of the National Health and Nutrition Examination Survey (NHANES) TV time questions51 with waist accelerometry-estimated SB but found weak (rho=0.14) or no (rho=0.03) correlations for adults in part-time or full-time employment, respectively. Similar findings have been reported in other large studies that used waist-worn51 52 or thigh-worn accelerometers,53 with coefficients ranging from 0.05 to 0.17. Besides not reflecting sitting time, TV time is confounded by factors that are strong determinants of poor health outcomes but are not always accounted for, such as dietary intake and TV time snacking,54 socioeconomic status (SES)55 56 and mental health.57 The role of socioeconomic confounding is particularly important. Although higher SES has been linked to higher total sedentary time and occupational sitting time,55 high TV time has been invariably linked to low SES.56 The more aspects of SES are considered (eg, education, occupational class, income), the steeper the socioeconomic gradient of TV time becomes.56 Aspects of TV behaviour, such as programme content or the exposure to negative messages that may act as chronic psychological cardiovascular stressors58 have hardly been acknowledged in the SB literature and are universal residual confounders. Besides, TV evidence becomes less relevant as the recreational screen media landscape is rapidly changing with TV viewing gradually being replaced by small screens such as smartphones and tablets. With all this and other supporting evidence59 in mind, it is unlikely that TV viewing evidence reflects health harms of sitting. The inclusion of such evidence to draw public health guidance on sitting has therefore been problematic. Interpretation of ‘SB’ studies: ‘Chinese whispers’? Among studies that reported associations of multiple markers of SB with longitudinal outcomes, TV time invariably shows the most consistent associations.60 61 While this may partly reflect that TV can be recalled more accurately, the literature cited in the previous section indicate that there is little support for the idea that health risks associated with TV viewing9 62 63 can be attributed to sitting. There are several evidence interpretation implications that follow. First, the approach taken by some otherwise high-quality reviews that meta-analyse TV studies together with total sitting studies9 62 is questionable. Such practices unavoidably lead to misleading interpretations about sitting. For example, a meta-analysis of 10 cross-sectional and prospective studies concluded that among all health outcomes, the strongest associations were observed for T2DM, where the highest category of SB time was linked to 112% higher risk for T2DM (95% CI 61% to 178%) compared with the lowest category.62 Another review of prospective studies,9 meta-analysed five of the above studies and also concluded that among all outcomes, the largest effect sizes were again observed for risk for T2DM (>90% increase in risk, 64%–122%). Based on these findings,9 62 diabetes is frequently highlighted as the outcome most closely linked with SB.63 All but one of the original studies in these meta-analyses used TV time as the exposure.3 6 64 65 There are further methodological issues that make such evidence less convincing. For example, the individual studies effect sizes entered in the meta-analysis were often derived using extreme comparisons, for example, ≥7 hour/day versus <1 hour/day66 or ≥40 hour/week versus <1 hour/week.3 PA was not always taken into account62 and estimates were not adjusted for body mass index on the grounds of adiposity being on the causal pathway between SB and the T2DM.62 But this is only an assumption as little evidence supports the notion that sedentary behaviour is associated with subsequent obesity.67 To the contrary, a number of prospective studies68–70 suggest that adiposity determines future SB (and hence adiposity precedes SB on the causal pathway). How evidence based are the recommendations for breaking sedentary time? One widely discussed concept in SB is that of ‘sedentary breaks’, referring to interruptions of prolonged sitting. Different variations of such interruptions are included in the guidance of several countries12 15 16 18 19 and in the case of the New Zealand guidelines,16 ‘sit less, breaking sedentary time’ appears before the PA recommendation. Sedentary breaks have been proposed to confer cardiovascular and metabolic benefits even when total sitting time is held constant74 but the evidence supporting their health effects is often inconsistent and limited to small-scale trials in selected samples. Even cross-sectional studies present an unclear picture, including the largest published cross-sectional study of thigh-worn inclinometers that found little evidence for associations of sitting with glucose metabolism among 2497 adults.75 In the study that first introduced the concept, the number of SB breaks of 170 adults was inversely associated with triglycerides and to a lesser extent with adiposity surrogate markers and 2 hour plasma glucose, while there were no associations with blood pressure and high-density lipoprotein (HDL) cholesterol.74 A subsequent larger cross-sectional study among 4757 NHANES participants76 found inverse associations of breaks with waist circumference, C-reactive protein, HDL cholesterol (women only), but no associations with the remaining five examined cardiometabolic risk factors. In cross-sectional studies, the most consistently associated outcomes with sedentary breaks are adiposity related,77 but these may be prone to reverse causation, that is, obese people sit continuously for longer periods of time. Despite this mixed and rather weak evidence, such cross-sectional studies74 76 have been broadly cited as support for the links between sedentary breaks and cardiometabolic health. To date, very few large-scale prospective studies assessed the links between sedentary breaks and cardiometabolic outcomes and, to our knowledge, none of them fully supports links between frequency of interrupting sitting posture and prospective outcomes. For example, baseline sedentary breaks did not predict any of five cardiometabolic variables at 6-month follow-up in a study of 582 patients with T2DM78 and were not associated with ACM over 5 years of follow-up in a recent study of 1655 older British men.79 To our knowledge, there is only one prospective epidemiological study that provides some support to the sedentary breaks hypothesis, the REasons for Geographic And Racial Differences in Stroke (REGARDS) study of 7985 US adults where longer SB bouts (directly related to infrequent sedentary breaks) were associated with increased ACM risk over 4 years.80 However, this, like both other prospective studies above,78 79 used waist-worn accelerometers and their findings may also reflect interruptions of standing with ambulatory movement (highlighting the benefits of frequent PA), rather than interruptions of sitting with bouts of standing or light ambulation (which is what the sedentary breaks hypothesis postulates). Despite the scarce prospective epidemiological evidence, it is encouraging that some national guidelines18 19 specifically recommend interrupting sitting with physical activity (table 1). Studies of objectively measured SB and mortality: can they support sitting guidelines? The above body of evidence offers little support for guidelines on sitting. First, results from mortality studies are relatively mixed, even when analysed within the same NHANES data set.60 90 91 Most importantly, no published study with mortality or incident disease endpoints, to our knowledge, examined sitting (as a posture). All studies summarised above used waist-worn accelerometers that do not completely distinguish between standing and sitting; their output that is commonly labelled ‘sedentary behaviour’ is actually lack of ambulatory movement (acceleration). Even if such studies that generally supported a deleterious association between SB and mortality were to be considered in isolation, the public health message they would clearly support is ‘move more (at any intensity)/do not stay still’, not ‘sit less’. Such confusion could be resolved in the future if the recently introduced term ‘stationary behaviour’26 is used in a standardised manner and interpreted in terms of benefits of ambulatory movement, not the harms of sitting. Are we close to understanding the threshold of daily sitting that is harmful? It is well established that the association of daily sitting time and most long-term outcomes is not linear. Dose–response evidence on mostly self-reported sitting time in adults suggests that CVD risk is elevated at approximately 632–1094 hours/day, while the corresponding threshold for ACM appears to be approximately 8 hours/day.32 95 But how confident can one be that the above self-reported daily thresholds are close to the true population values of sitting? Comparative international studies consistently report median self-reported durations in the region of 5 hours/day.96 97 On the other hand, national surveillance studies that used waist-worn accelerometers61 98 and smaller studies that used inclinometers53 75 reported estimates in the region of 8–9.5 hours/day of SB and sitting, respectively. Taken together, it appears that self-reports may underestimate sedentary time by a relative large margin when compared with objective methods. Although it is difficult to estimate the exact degree of measurement error from self-reported sitting time, the above data suggest this could be as high as a 40%–60%. This may have implications for the thresholds identified in the above meta-analyses.32 95 Theoretically, if assuming a similar proportion of reporting errors from previous epidemiological studies, the daily thresholds94 95 for an association between self-reported sitting and health outcomes at the population level may be as high as 11–13 (ACM) and 14–16 hours/day (CVD). Although the above extrapolations are too crude to form the basis of guidelines, such high amounts of daily sitting may reflect underlying poor health more than a sedentary lifestyle. In the absence of long-term prospective epidemiological evidence from studies that used objective measures of actual sitting (as opposed to absence of ambulatory movement), any quantitative daily sitting guideline may be misleading. In its current state, the SB evidence base is insufficiently developed to inform quantitative public health guidance. Some of this uncertainty is due to misleading media reporting and researcher enthusiasm, which portrayed SB evidence as nearly conclusive. The limitations of sitting measurement outlined above is another major issue. While waist worn accelerometers were undoubtedly a major step forward and are useful for understanding the health risks associated with the lack of ambulatory movement, they tell us little about the health risks of actual sitting. Questionnaires are useful and feasible for large-scale observational research and surveillance but they may be prone to systematic reporting bias. Quantitative data from these instruments should be interpreted cautiously and it seems premature to develop quantitative sitting guidelines based on self-reported data only, considering the major advances in the application of objective measures of sitting in ongoing epidemiological studies. Technology that uses thigh-worn sensors or combinations of placements (eg, thigh and hip or back) are more promising for quantifying actual sitting time. To our knowledge, there is no published prospective SB study using such methods. Although the use of such tools in large population studies has been relatively limited in the past, for the first time it seems feasible. Examples include the Maastricht Study76 and the 1970 British Birth Cohort99 that are currently using thigh-worn sensors in estimated samples of appoximately 8000 and 6000–6500 adults, respectively; and the HUNT cohort in Norway100 which is currently using two sensors (thigh-worn and lower back) in an estimated sample of 40 000–50 000 adults. These and several other studies that use similar methods can be linked to mortality and incident morbidity records. Thus, it is likely that these studies, in the near future (perhaps within 5–6 years), will produce evidence on the prospective associations of actual sitting time, sedentary breaks and accumulation patterns with mortality and incident morbidity. Further, emergent analytical approaches that may overcome issues such as collinearity and better handle multibehaviour 24 hours data (eg, compositional data analysis101 and isotemporal substitution102) are increasingly used. These statistical approaches have some clear advantages in that they acknowledge the interdependence of times spent in different components of the 24 hours continuum (sitting, standing, light activity, moderate to vigorous activity and sleep). But when it comes to generating evidence that will inform public health guidance they also have their own challenges, such as is the lack of clarity on how to translate ‘budgets’ consisting three or four components of the 24 PA continuum into simple public health messages. Despite these uncertainties (that will hopefully be resolved as the field evolves), the collective capacity of all these developments, including recent advances in activity pattern recognition,103 may change what we know about the health effects of bodily movement (or lack of it) within the next half decade. Developing credible prospective epidemiological evidence on the independent long-term health effects of sitting with long-term health outcomes is one of the most important links in the public health evidence guidance chain. This link is currently missing. Refinement of the research paradigms used in the sedentary behaviour field is the first step towards advancing our understanding of the independent health effects of too much sitting. The study of sedentary behaviour (usually, but not always, synonymous to ‘sitting too much’) as a health risk has received considerable research attention. Non-quantitative public sitting guidelines have been included in public health guidance in several countries and usually consist of messages to sit less and break prolonged sitting times. We still know relatively little about the independent detrimental health effects of sitting, and there are many inconsistencies in how the evidence based was developed and interpreted. Key issues include an unclear definition, inconsistency between mechanistic and epidemiological evidence, over-reliance on surrogate outcomes and weak epidemiological evidence to even support the existing non-quantitative ‘sedentary breaks’ component of guidelines. The sedentary behaviour evidence base is underdeveloped and inconsistent; it cannot support quantitative guidance. Prioritising a message such as ‘move more at any intensity’ while further research gives and robust and consistent answers about sedentary behaviour may be the most prudent course of action.
. Physical activity and television watching in relation to risk for type 2 diabetes mellitus in men. Arch Intern Med 2001;161:1542–8.
. Physical inactivity, sedentary lifestyle and obesity in the European Union. Int J Obes Relat Metab Disord 1999;23:1192–201. Department of Health. Start active, stay active: a report on physical activity for health from the four home countries’ chief medical officers London: England, 2011. US_Department_of_Health_and_Human_Services. Physical activity and health: a report of the surgeon general. Atlanta, GA: US Department of Health and Human Services, Centers for Disease Control and Prevention, National Center for Chronic Disease Prevention and Health Promotion, 1996. Department of Health. Australia’s physical activity and sedentary behaviour guidelines for adults (18–64 years). Canberra, Australia: Australian Government, Department of Health, 2014. New Zealand Ministry of Health. Eating and activity guidelines for New Zealand adults. Wellington, 2015.
. [German national physical activity recommendations for adults and older adults: methods, database and rationale]. Gesundheitswesen (Bundesverband der Arzte des Offentlichen Gesundheitsdienstes 2017;79(S 01):S20–s28.
. The sedentary office: a growing case for change towards better health and productivity. Expert statement commissioned by public health England and the active working community interest company. Br J Sports Med 2015. Network SBR. Standardized use of the terms “sedentary” and “sedentary behaviours”. Appl Physiol Nutr Metab 2012;37:540–2.
. Physical activity in adults. In: Racher Craig JM , eds. The health survey for England 2012. Leeds: The Health and Social Care Information Centre, 2013. Physical Activity Guidelines Advisory Committee. 2018 Physical activity guidelines advisory committee scientific report. Washington, DC: U.S. Department of Health and Human Services, 2018. Contributors All authors have contributed substantially to the preparation of this manuscript. ES conceived the original idea, carried out the initial literature searches and drafted the first version of the manuscript. UE, DD, MH, AEB and I-ML contributed to the idea, redrafted parts of the manuscript and contributed to further literature searches. All authors revised the manuscript critically several times and contributed intellectually its contents. ES takes responsibility for the integrity and accuracy of the information contained in the article. Funding This work was not financially supported directly by any individual, agency or institution. ES is funded by the National Health and Medical Research Council (Australia) through a Senior Research Fellowship and partly supported by a University of Sydney SOAR Fellowship. DD is supported by a Future Leader Fellowship from the National Heart Foundation (Australia); and partly supported by a University of Sydney SOAR Fellowship.